And we are done with an exciting five days of racing in Italy! The outcome couldn’t have been any better with a GC podium sweep from some of the team’s young guns, and this race was another big step in their progression. I came into this race unhealthy and frustrated to be missing Volta Catalunya, but now that I’m coming out the other side, I have a greater appreciation for being a part of this team. I’m better another honed in with my teammates and being a part of any win feels great. This one really stands out because it featured such a young up and coming group; I was happy to lay it on the line for them. Looking back the past two days, our seven-man squad took the race head on and asserted ourselves as the team to beat. Yesterday’s “sprint” stage was dictated by a breakaway and some teams chasing them severely miscalculated the chase. We were happy to sit back and save a bit of energy for the final stage but we were still all hands-on-deck where we needed to be in the crucial moments of the race. Observing the teams who lost out on the sprint was perplexing as they clearly had the horsepower but mismanaged their resources bringing the gap down amazingly fast from 8 minutes to 2 minutes but then let it creep back up. They underestimated the final kick from the break and the role GC team position fighting would have in inadvertently distrusting the chase in the final lap. Today’s final stage was sure to be a doozy with the classic Italian roads--busted pavement and hardly a straight kilometer. 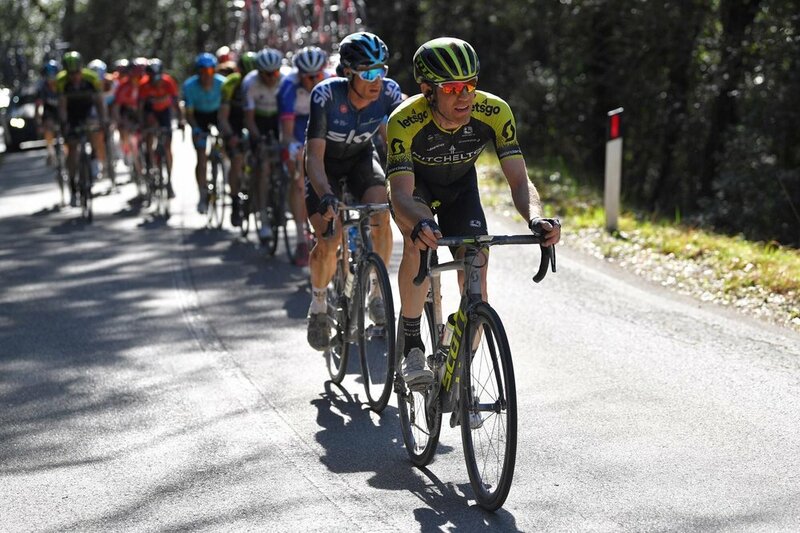 I was pleased to finally feel great from the start and put in some big efforts over the first climb to keep things under control and key rivals in check. From there, our freight train of Sam and Cam went to work. When a few counterattacks happened from guys sitting around a minute back in GC, it didn’t even remotely phase or deter them. Those guys dropped us off into awesome position with two climbs to go, and this is where the meat of my work took place. We paced some dangerous surges from Movistar up the climb and battled them to stay in the front group over the top. 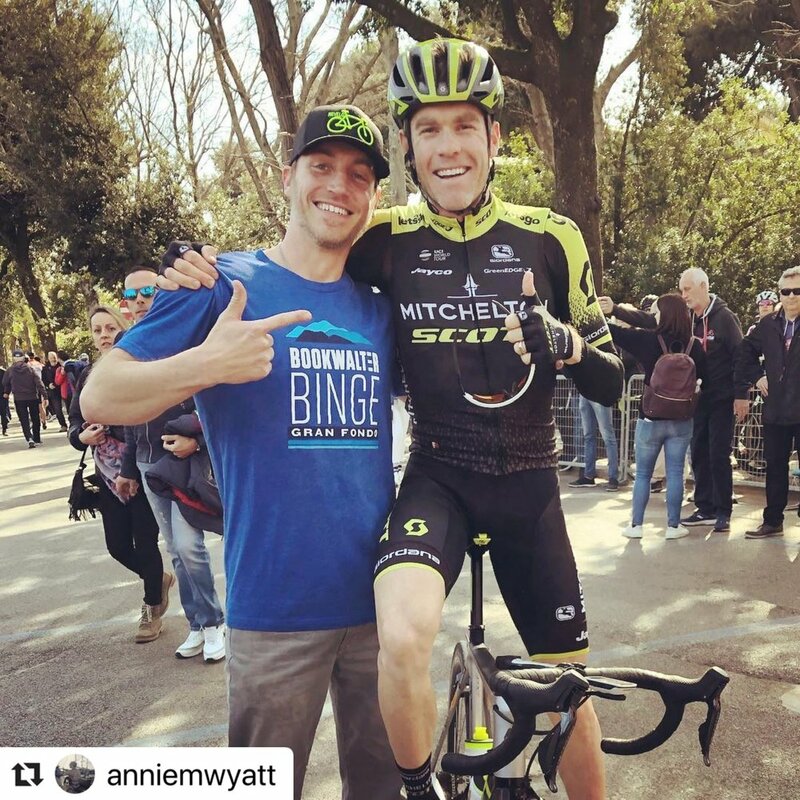 After analyzing this effort post-stage, I would see this was my best five minutes power of the year and another good indication that my health and form are on the return. The early break was almost back, but we were happy to leave them out there at a minute and so. Other teams came to drive the pace into the final climb. Rob and I used our last big digs to deliver the guys into the final climb in first position. Our three leaders set a super hard pace that deterred anyone from getting away. Damo sprinted to a solid third on the stage, and they locked up 1,2,3 on GC. This race maybe didn’t have the depth of some of the World Tour races, but it was great to control a race from start to finish and give Lucas, Damo and Nick a chance to shine. For me, it’s a bit of an adjustment. In the past, a race like this would have meant an opportunity for a result, but I found myself inspired and excited to execute a role for the guys and was really pleased with how we all came together and delivered in key moments. Now it’s back to Girona, for a quick reset and then a build towards an anticipated Giro start. For the past few days, it’s been impressed and excied to work for some of my youngest teammates: Rob Stannard, Lucas Hamilton, Nick Schults, and Damian Howsen. These guys were all world class (and even world champion) U23's and are clearly making huge strides as they step up into the pro ranks. Over the past two days, we’ve been defending the lead and doing our best to control an aggressive peloton on some equally crazy roads and terrain. For Stage 2, it makes for tough work but we were happy to ride at the front. The road conditions were dismal and the terrain relentless. When you add in the unknown of cars sneaking their way onto the course and some corners being less than clear as to which direction to go, it was a real bonus to be up front and have a clear line. Stage 2 was an awesome team work day where everyone contributed in a very obvious way, which isn't always the case and nice when it happens. My role was to take over from Sam and Cam for the final two climbs through the up/down finishing circuits. With the help of Nick, I got the boys about halfway up the final climb when the attacks started coming. Whether its early, mid or late in the race, it’s a good feeling to take over at the front of the bunch and whip up the pace for teammates who are riding strong and eager to deliver. Lucas claimed a close second on the stage and moved into the overall lead. Friday was another up down, twisty circuit that we tackled seven times. Fortunately, most of these roads had been resurfaced in the past 20 years and I think the close circuit made things a little safer in terms of the race marking and controlling road furniture. The ballistic first lap finally gave way to a solid breakaway that we were content with getting up the road. We kept them in check but were ok if they stayed away for the stage win because it would neutralize the available time bonuses. Sam and Cam put on a tempo clinic through the halfway point before a few other teams began ramping up the pace. At times they would shred it full gas, only to lose most of their teammates and then sit up. This sliced the gap to the break, and it looked like it would be back together for the final lap. I fought hard to stay in contact with the reduced group over the top and provide support for our leaders. The group began to swell on the downhill back to the finish and the fast run-in was chaotic and uncontrolled. We were happy to get our top three guys safely in on same time and now look to tomorrow which should be a sprint day but seeing how most of these teams ride and how little they are willing to commit for any one leader, its anyone’s guess how it will shake out. On good news--my guts seem to be improving little by little. It’s challenging to get stomach recovery in when we are tossing down the quantities of food needed to fuel for these races, but I’m encouraged that I'm at least going in the right direction and hoping to keep improving. It was a long one and I can't remember the last time I did two races in one day?! We are back in Italy, but it feels so different from Tirreno. Physically, I am feeling much healthier than a week ago when I was literally hugging the toilet all night, but I can feel my body is still rebounding from that and paying the price from a week that was a wash in terms of training. Right now, it is more about getting back to baseline. Everything started in the morning with a 100-kilometer road stage. This is a much smaller race, and we saw it immediately with super aggressive teams and slightly confused race organizers about where we were going in the neutral. We made it through the morning stage without incident and headed into the afternoon with big objectives. 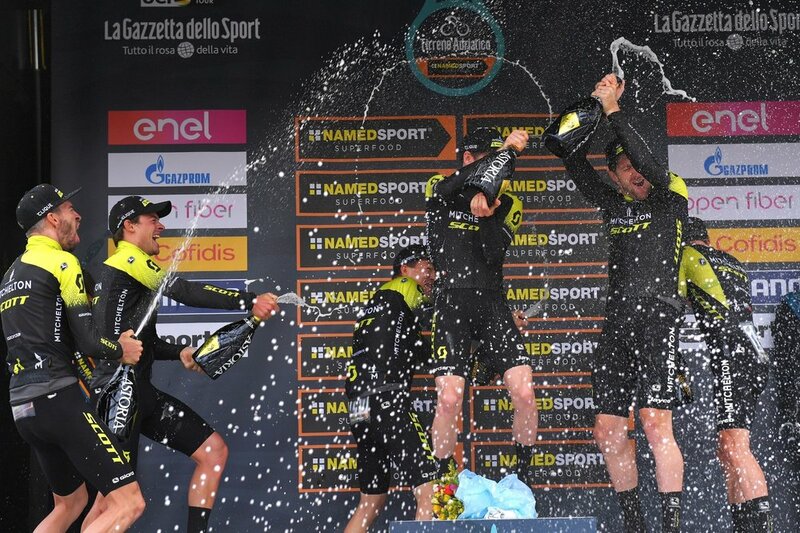 From the winning squad in Tirreno, there was only me and Damo, but as with most good TTT teams, the depth shows through the entire roster and today we had an awesome balance of youth and experience. Pre-TTT prep was a challenge with the course never really being closed for any inspection, another example of a smaller operation race. We knew the focus would be about riding off one another and getting good info from the car. It was a very technical first five kilometers with a little more speed in the second half but still some roundabouts that make things technical at those speeds. We started fast, kept going fast, and I think finished faster! I came off the group with around 2 km to go. I know TTT's need to be an egoless affair, but my ego still takes a bit of a beating seeing the guys ride up the road. Fortunately, it was enough to come out on top and it was all smiles on the podium. My young teammate Rob Stannard is in the lead after his fifth place in the morning stage. This dude is 20 years young! Watch out world! I’m looking forward to supporting the guys and we'll take each one day-by-day as the racing will no doubt prove unpredictable and crazy at times as these Italian teams fighting like their national pride is on the line and the more international teams are looking to flex their muscle in a unique opportunity with a slightly less deep field. Stage 2 of Tirreno-Adriatico was a good day, especially with open Italian roads and the leader’s jersey in the squad. The stage had a very Italian feel with a break going immediately. The twisty, undulating roads mixed with poor surfaces and winds kept us on our toes, but the boys rolled at the front all day, which gave us a chance to sit up front and out of trouble. It’s a special time to see the leader’s jersey riding tempo in the peloton. Heppy was doing that today and putting aside his own ambitions for Adam’s chance at the stage and the GC hunt. Overall, it’s a telling vibe within this team. It definitely made me feel grateful to be part of this group. The boys kept the break on a short leash and as we approached the final climb, Quickstep came up to finally close the gap for their man JA. The position fighting was nuts and was really hard to stay together as a team. It was one of the shorter days of the race, but we still put in 195 kilometers. With those solid five hours, I could feel the day in my legs as we battled for position into the last climb. Apparently, this climb is a Tirreno staple, so many of the guys knew what was coming, which makes positioning even harder. It was my first time on this climb, so I definitely was sparing a moment’s glance away from the wheels eye the GPX file on my Garmin as we approached the climb whenever I could glance away from the wheels on all sides of me. The final climb was in steps and proved to be quite tactical. Our guys launched Adam through the first step with an impressive show of power. I was caught a little farther back but was happy to be there as a safety for Adam. This came in handy as a few gaps began to open up and I did my best to seal them up for him. In the end, I was hanging onto the reduced group of around 30 as we hit the line with Adam in fifth. Tomorrow looks to be a long sprint day at 225 km but features an especially hilly and technical opening phase of the race. With only a few major sprinters here, it could be a more open race. We will keep taking it one day at a time with Adam now in the race lead. A winning day and it feels like a blur. These team time trial days are such pressure cookers. They are so drawn out from wake up to bedtime. It’s a huge effort from staff and riders to check all the boxes and execute every step of the process, culminating with the performance on the road where there is no hiding. We see the ultimate test of team power, cohesion, communication and technique. If there were a way to get in sync with these guys as fairly new teammates at 60 km/hour for 20+ minutes on slickened and pothole-ridden roads, we would do it! Coming into the day, I had to remind myself that I’ve been here before and know what it takes to contribute to a winning TTT effort. While the bike still feels a bit new and this would be the first time lining up in TTT formation with a few of these guys, we had some serious experts in this group. It was a very well-rounded group and overall a deep team. I could see the others reacting and feeding off each other almost on autopilot and I did my best to dive in and trust my instincts too. The day wasn’t without drama as we had a bit of confusion about our start time. After a bit of scrambling, we got up there and were organized. After that bit of adrenaline, we shot down the ramp and into the tailwind at warp speed. I think it initially made us all wonder how we could keep it up for 20 minutes. We receive time checks throughout which were encouraging but we knew there would be little to no buffer and every second counted. Coming through the few corners about halfway, I got a couple quick breaths before launching back into the headwind where our turns on the front shortened up and the suffering really began to sink in. We got some selfless and powerful turns from Damo and Chris inside the final 5 kilometers before they peeled off. Then it was five left and with the fourth guy crossing the line time as the one who counts, so there was no room to burn anyone else. Flying into the last chicane with just over a kilometer to go, we came out and there was a lady and her dog in the middle of the road! Fortunately, the corner had us on high alert and out of the aero bars. We just missed hitting them and battled home with Whitey yelling in our ear to sprint for the line and fan out. Heppy drove us through the final 500 meters and had the pace so high we were all strung out and glued to his wheel as we got to the finish. Then we heard the awesome news that we had won! I’ve done Tirreno a few times but was never part of one of BMC’s winning TTT teams here. I was often a reserve during those years. I was even here at the hotel in the days leading up only to then not to start. To come here with this squad--an awesome group of guys I’m getting to know better by the day---and execute out of the gun is an awesome, awesome feeling and one that is shared equally throughout the team no matter what part of the process or ride you contributed. We will enjoy having Heppy in the leader’s jersey tomorrow and take each day as it comes. Five very long and demanding road stages coming up over the usual bonkers Italian roads with an exceptionally deep field will keep us on our toes and test all of our early season capabilities. 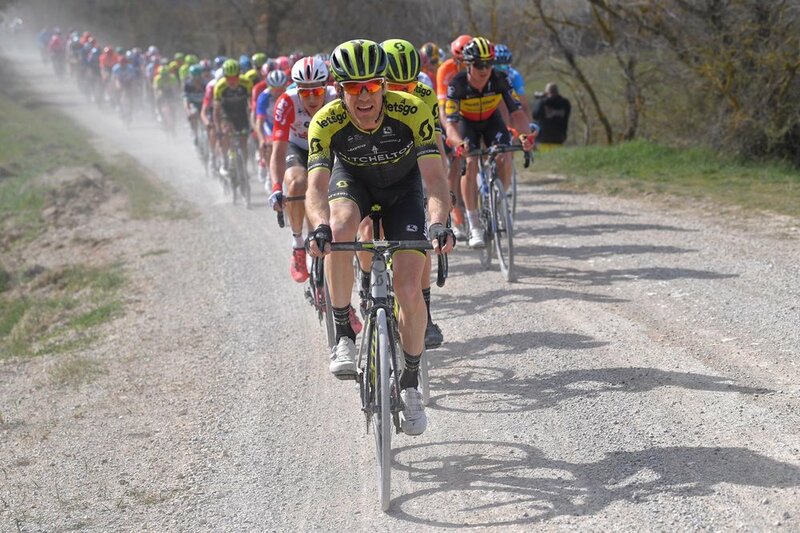 After being pulled out of last year’s Strade Bianche just a few days before the start, I have been itching to get back. Being a new guy on MTS, I’ve been very accepting and open to management’s proposed program, but this was the one race that I asked to do. I was grateful they supported my ambition to get back on the white roads of Tuscany. My first edition of Strade was back in 2010 and I was instantly hooked. Although it carries a high dose of madness, danger, and difficulty like most one-day classic style races, this is a race that gets me amped up just thinking about it and that finish line scene in Sienna is my favorite in the sport. Coming off UAE and less than a week in-between, I knew to anticipate a shock to the system as we blazed through the technical neutral and into km 0. This was the first time I've done this race without a recon the day before and that amplified the shock. Add to new tires that I had never ridden on these surfaces and being a bit unsure of pressure, the anticipation ramped up even more. Our young guys did a great job marking early moves, which allowed the rest of us to stay as calm as possible. It was still a fight into the first sectors, and I think everyone was blown away by the amazing amount of dust and extreme lack of visibility. This was the loosest and driest Strade I've ever seen it. Some areas felt like loose gravel while others were nearly beach sand. Even at the front of the bunch, it was dusty as the cars and motos in front of the race kicked up a huge cloud. The race played out as we expected over the first 60 or so km. It was very fast, aggressive and lots of dust! A quick regroup as we did the longest paved climb of the race up to Montalcino (the iconic 2010 TDF stage finish that Cadel won was my first foray into the Strade Bianche roads even before the official race). This is where things started to get intense with the next 20 km being continuous dirt, up, down, twisting, off-camber and windy exposed. It’s hard to stay together as a team during those intense moments, and I was reminded that we are still learning to ride together. The following sectors didn't disappoint when it came to drama. I saw multiple guys bite the dust, suffer punctures and on more than one occasion, I found my wheels ricocheting off riders on the ground, barely getting over and around them. There are so many close calls in a race like this that we quickly lose track of them so that we can stay present and focused. It was my job to stay with our leaders Luke and Chris into the next sectors where the race would likely explode, and the early final of the race began. I could feel the repeated maximum efforts wearing on my legs but stayed vigilant to be up front and with those guys. In previous editions, I had escaped in late counterattack breaks on these sections and wanted to keep an eye out for the same chances. I did find myself on the front of the bunch on a few occasions with one of our protected guys, Chris, on my wheel and out of trouble. The Mont St Marie sector almost always proves decisive. The out of control downhill pavement into this sector sets it up and makes positioning very difficult. We all ended up freelancing a bit and turned left onto the dirt a little farther back than what was ideal. The lead-out guys were now exploding, and leaders started to make their moves. It was another max effort of desperation to make up as much ground as possible, but the splits were already happening and the damage was done. Over the top, I linked up with Chris, Luke and other team leaders such as Nibili, Thomas, Kung, Dillier--whose teams had also missed the front selection. I dug in and began working to keep the front group in check, hoping that things would get tactical and a moment’s hesitation would allow us to come back and keep Luke and Chris in play. Luke had a problem with his saddle that required a trip to the car and put a dent in his legs. Eventually, all three of us were riding through in a last-ditch effort to stay in the game. The gap came down to 20 seconds as the front group started splitting, but as we often see in these brutal one-day races, there seems to be a terminal velocity of any group on the road and gaps became exponentially harder to close the deeper you go into the race. As we approached Sienna, our group began jockeying to race for a top 15 place. I had spent all my bullets in the chase, so knew I would be in survival mode up to Sienna. I arrived there having left everything out on the road and grateful to survive in one piece. I made sure to soak up the fantastic finish line environment. Personally, I know there is definite room to improve, and in terms of the team, but I am enjoying riding with them and staying focused on the process and what is in our control to improve. Next up, a big week in Italy at Tirreno Adriatico that will serve up another big step up in difficulty with some mountainous terrain, long stages, TTT and ITT and some new teammates to race with for the first time. 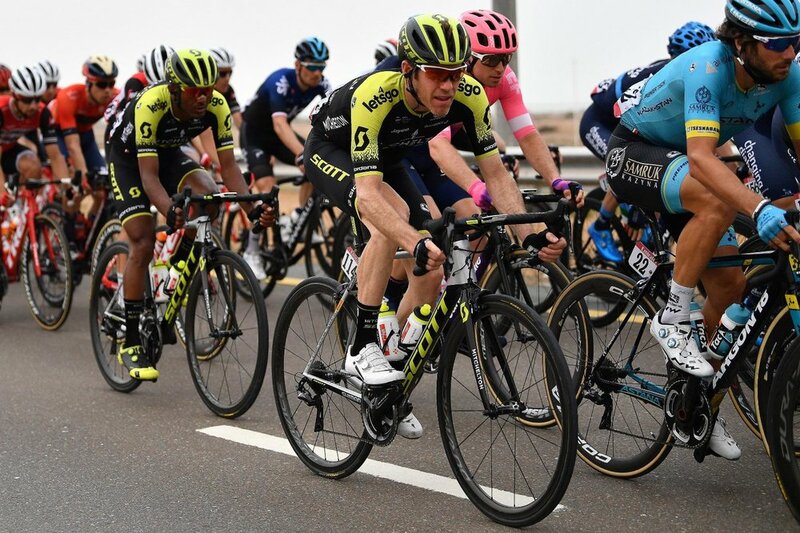 Stage 6 at the UAE Tour was very chaotic with a big crash at the start that caused confusion and havoc. Our plan was to let some guys give the break a try if there was interest from other strong teams and Alba did a great job getting himself in there during those extremely fast and chaotic kilometers at the beginning of the stage. We were hoping Lotto would let the gap go a little bigger and believed they had a chance of staying away. Like always, it depended on the wind direction and how the peloton rode the early portions of the climb. The final climb was another bizarre desert affair. The air quality was absolutely atrocious. For me, that was a decisive factor. The pace was quite controlled and moderate for the first 10 kilometers and the group remained large. With the big sweeping corners and large group, it became a game of holding position while still staying out of the wind and conserving energy. The guys did a great job positioning Tsgabu and me in the approach to the climb and on the first half of the climb thanks to some great intel from Luka who had ridden the climb before. Sam, Jack, and Callum hung on late into the climb and gave us a hand with sheltering and positioning. Once the pace cranked up, Tsgabu and I tried to stay together but were both a little too far back when the front guys opened gaps. I closed a few of them, which proved to be my undoing in losing contact with the group but helped Tsgabu stay there a little longer. Considering the length of this climb and knowing this race was mostly meant to be about riding into it, I’m happy I had the chance to push myself all the way to the line. Another step in learning to work with the guys. I didn’t come here expecting to have the boys rally for me, but it’s a great example of the culture and closeness within this team that we all chip in where we can for each other, and I am excited to build on this in the coming races. It was a long day out there for at the UAE Tour. Despite being a fairly small country in size, we seem to rack up a lot of time on the road between cars and bikes, Stage 5 was 11 hours of constant moving. Out on the road, it was once again windy and we had yet another nasty sand storm that coated the eyes, mouth, bikes and everything else. I had a few moments of questioning what I was doing here, riding across the barren desert on what seemed like a road to nowhere, hacking up sand and scraping my eyelids across my eyeballs. While wind direction was enough to keep some tension in the bunch, there wasn’t any major wind drama. On days like this, some guys in the bunch complain about being bored or that they are losing fitness. I put my efforts on the mental focus that it takes to ride in these conditions and so close to one another for five hours. Trust me, it is no walk in the park. The lead into the sprint was fast and quite hectic. At one moment I was on the right side just behind a lined up FDJ. The middle of the road opened next to them and they started yelling and screaming at each other to go! Moments later a couple of them were hurtling off their bikes and I just squeaked around them. I felt a bike or body nick my rear wheel as I went by. It was close. In the finish, we tried to give Luka a hand but were no match for the hyper horsepower sprint trains. Tomorrow we get back to a new big climb at the end of the stage. A 20 kilometer summit finish will surely prove decisive and provide another chance to test the condition after five days of racing. I’ll be picking the sand and desert grime out of my hair, ears, eyes and everywhere else for a while following Stage 4 of the UAE Tour. A stronger breakaway group went away early and were given a substantial leash. Back in the bunch, the top GC teams played some games trying to get each other to work. I never can quite understand that squabbling, especially if you are a team like Movistar with a guy like Valverde. If you show time and time again that you have the best guy in the race, just stick a guy on the front and get to work. They eventually did and we knew it would be a fast second half of the stage heading into some small climbs and a punchy uphill finish. The forecasted light winds proved false and the group was back into high alert as the winds whipped up and sand rained down on us midway through the stage. For a moment, we had some massive crosswind splits and visibility was so bad that it was hard to see who was where on the road. I think it came more out of defense than offense and we eventually regrouped as the sand storm subsided and we headed into slightly hillier and sheltered terrain. We planned to position my Luka for the final 200-meter uphill sprint, and we did well staying up front and definitely got lucky to be on the left side of the road when the massive pileup happened around six kilometers remaining. Then pace eased up as everyone took stock of who was there and who wasn’t. This made the final technical kilometer even more dicey with the group swarming on both sides. When we hit the wall in the final 200 meters, I knew I was too far back as we rounded the corner. The guys in front of me were instantly coming backward. Fortunately, Luka went through in better position and powered to a solid fifth place. I was just outside of the top 10. Even more than the placing, I’m happy to be safely through and have another day of some substantial race efforts in the legs, though I’m sure they will leave a mark! Tomorrow should be a flatter sprint affair, but with these shoddy forecasts and windy conditions, it’s anyone’s guess what sort of shenanigans will play out on the road. Flat flat flat then “whack” is how I would describe today’s stage at the UAE Tour. The square-shaped lap in the desert provided some mellow headwinds, potential crosswinds, and fast tailwinds, but never had the right combination for the crosswind action we saw yesterday. 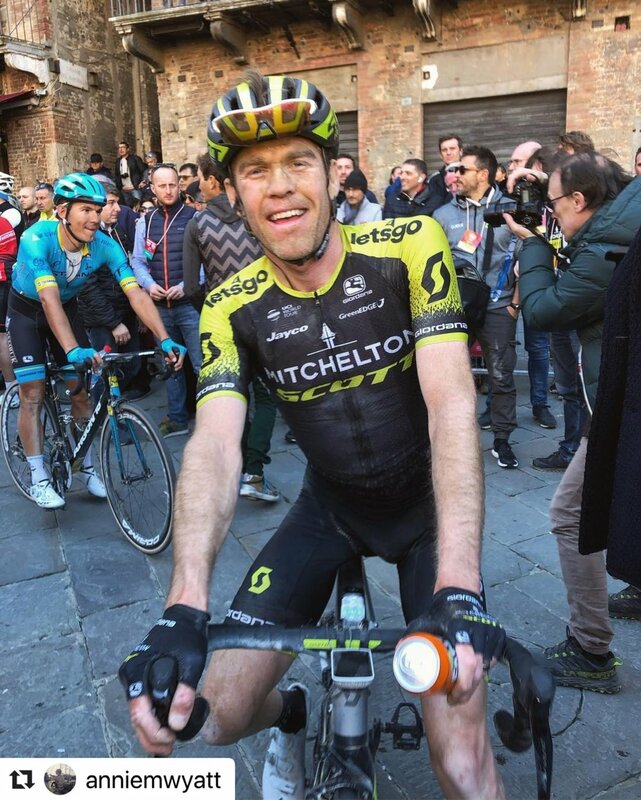 Our plan for Mitchelton-SCOTT was to ride for Tsgabu. Being here as a climber-light squad meant the final teammate duties fell to me. It was another day of learning how to work with each other, and the guys did a great job of keeping us out of the wind and fueled up throughout the stage. I definitely didn’t come here expecting to be up there with the best climbers, but I also wanted to do my best with the opportunity of not having to plow wind or work too hard in the early phases of the stage. Like any flat stage with a summit finish, the battle for position started super early and was especially hectic and fast with a full peloton and plenty of sprinters and lead-out guys there to whip up the pace and play chicken into the roundabouts and corners. The team did a great job of keeping Tsgabu up front and I ended up surfing on my own. Approaching the final climb, I linked up with Jack Bauer. He did a fantastic job of dropping me off in a good spot---not too close to the front but far enough up that I was clear of the dropped rider shrapnel as the pace lifted. Just like last year, the pace on the climb was very fast, but I think a little steadier. Still, once we hit the meat of the climb, I was doing everything I could to hold the wheel and stay in the group. I saw Tsgabu start to slide backward and eventually lose contact. I ratcheted it back and waited for him for a moment hoping he would refind his rhythm. He told me just to go, so I set out to regain contact with the group I’d dropped from. The effort crushed my legs, but I steadily clawed back a few guys as they started to explode while other riders came past from behind. I kept the pressure on and finished with a respectable small group just over a minute back. The communication delay is another example of how I’m learning to work with and for my new teammates, so I’ll chalk it up to experience. Now we reshift our focus. Tomorrow will be an interesting stage as it could suit sprinters or even fast GC riders. I was sixth on tomorrow’s finish when I last did the Dubai Tour (2015), but my teammate Luca will be our rallying point and leader. If we come into the dam as a full bunch, we will look to slot up there for the punchy uphill kick to the line. Stage 2 of the UAE Tour took us out into the desert with an expected bunch sprint in the end, but the day was by no means straight forward. The final sprint was only a small fraction of the action with strong winds making it a day of contrast. While I’ve gone through the pre-race motions to have the hang of it, the first day of wiring up radios, metering how much food I put in my pockets and having a pre-race strategy meeting with the guys was a bit of an adjustment and reality check that the race season is here. Some additional “new team” challenges included learning how the different bottles are labeled and having a new director on the radio for the first time. In these desert races, it’s no secret that wind direction makes all the difference. Today, kilometer 66 was the big ‘X’ on everyone’s stem sheet, and that proved accurate. It was the exact point where things heated up and blew apart. Last year, we raced this same section with same wind drama, so that made the battle even more anticipated and crazy. The bunch split into more than a handful of groups as the wind literally sandblasted us, and everyone panicked to move up while staying as sheltered as possible. It only takes one small gap for a moment and then the elastic snaps. We had Sam Bewley up in the front group while the rest of us were caught in groups farther back. We contributed to some of the chasing in hopes of keeping the front guys close enough that they would lose some enthusiasm once we reached bigger roads with less drastic wind. Fortunately for us, other top GC and sprint teams missed getting their leaders up there and we had enough to pull things back together. Then it was calm while everyone refueled and stocked up for the next block of potential wind and sprint lead outs. Tsgabu--our protected GC guy here--had an untimely flat with about 10 km to go, but a quick bike change and teamwork got him back without too much stress. Tomorrow we head to Jabel Hafeet. I raced up that beast last year, and I don’t have fond memories of it. It’ll be a bit of a climbing test as we work to help Tsgabu do his best ride possible. The race season kicked off with a blazing fast TTT at the UAE Tour. It was a good way to start the season and to finally have my first official outing with the MTS crew. These TTT days pack so much into a short race effort, so I feel like I got a lot of bang for my buck in terms of settling in with the guys, the bikes, staff, team protocols, schedules, etc. When you are out in the desert and away from the usual team trucks and buses, it means that everyone is a little more relaxed and adaptable around the TT buzz. For me, this is a solid way to start. Physically and mentally, it means a very focused and intense effort and today was far from flawless. We almost all came crashing down after a touch of wheels and slight misdirection from the wind and miscommunication after about 6 kilometers. Fortunately, we kept it up with a couple of guys going off into the sand. Quickly we regrouped and got it going again. After that, we found a nice rhythm and were able to empty the tank by the finish. Everyone gave everything of themselves for the team. For me, I really appreciated how quickly we regrouped and handled the adversity. It’s a real takeaway to see how everyone handles moments like those. For me, I will only continue to improve on the new TT bike, and I’m confident we laid a solid foundation for the year ahead. And we have maybe learned a few lessons and place to improve. Tomorrow we head into the road stages where the wind always is a factor and potentially decisive.